BikeRoute™ is an innovative service for cities and regions who aim to increase bicycle traffic or become more bicycle-friendly. BikeRoute™ provides key information to help a city or region to quickly identify areas of improvement for increasing bicycle use. The service produces informative maps that visualise the quality of a citiy's bicycle infrastructure and allows planners to identify and illustrate weaknesses, potential improvements and complex relationships. The results help decision makers to better understand and identify the most cost effective measures to improve bicycle traffic and to avoid costly investments that promise little value. BikeRoute-maps show the accessibility of different parts of a bicycle route network at a glance, among other features. By using BikeRoute™ cities gain access to a unique database that allows benchmarking with other cities for comparison and learning. For example, a city with low bicycle usage can see how it differs from other cities with higher bicycle usage and then simulate the impact of different measures. Comparative figures for actual bicycle travel speed on different types of infrastructure – a unique feature of BikeRoute™. The BikeRoute™ concept uses GPS technology and specially developed analysis software to describe the quality of a city's transport system from cyclists' perspectives. Reducing greenhouse gas emissions from traffic is a challenge all cities face, as are noise and air pollution. Making cycling a more attractive mode of transport in your city is an efficient measure to achieve environmental goals while contributing to a livable city. Bicycle planning has the opportunity to become faster and more efficient. To be able to quickly and objectively identify problem areas is an important step in improving bicycle planning. The transparency offered by BikeRoute™ facilitates the planning process and allows for comparison of alternative options. Many different measures can contribute to making urban bicycling safer and more attractive, for example better bicycle parking, increased accessibility on local streets and bicycle paths and marketing efforts. How should planners prioritise measures to achieve optimal results? Where should improvements be made first? BikeRoute™ assists planning by describing the quality of the existing traffic network in a manner that is quick and simple to communicate. By understanding the quality of existing routes it becomes possible to design cost-efficient plans for improvement. BikeRoute™ also provides feedback on the impact of previous investments. The safety and comfort of bicycle infrastructure greatly depends on its design, as illustrated in the graph above (based on Teschke et al 2012). 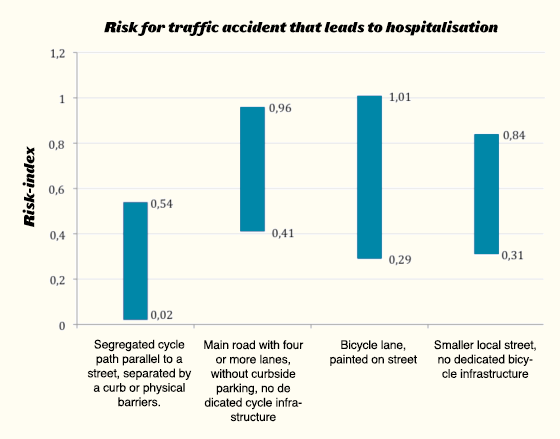 Poorly designed segregated bicycle paths may add no additional safety compared to cycling on roads, and cycle lanes can induce a faulty notion of safety. Recruitment and interaction with bicycle users. Data collection with precision GPS equipment and optional photo documentation. Establishment of a digital route network for bicycles. 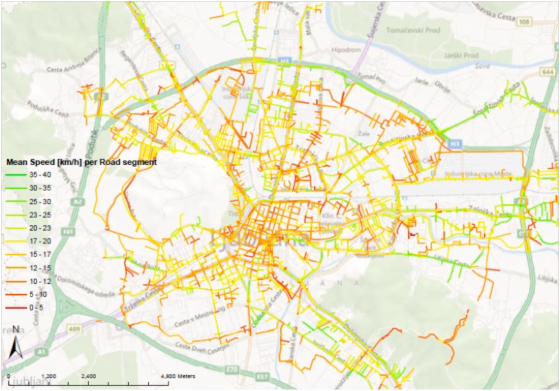 Production and analysis of maps that illustrate the quality and features of the bicycle network. Calculation of indicators that allow comparison with other cities and over time. Suggestions to improve the infrastructure according to local and regional goals.